A few years ago, one of our projects involved focusing our pantry on the bare essentials; raw ingredients that could be used to make almost any recipe imaginable. At the time, I posted pictures of the early stages, which included different types of flour (bread flour, with higher protein for baking loaves of bread, all-purpose flour, cake flour); different types of sugar (white sugar, raw sugar, light brown sugar, dark brown sugar); assorted dried fruits and berries; various types of nuts; vinegars and shortenings; white rice, brown rice, long-grain rice, short-grain rice; dozens of varieties of lose tea. We also built a huge McCormick spice selection so, with few exceptions, we could make almost any type of dish from any type of cuisine from around the world. It turned out to be one of the best things we ever did. The amount of time and preparation necessary to cook recipes from scratch plummeted. We installed hanging hooks below the shelves to store the Mauviel professional line of copper pots we use, which remain the workhouses of the kitchen (the Ruffoni are beautiful, and we do cook in them, but they are stored with the Le Creuset and Staub). 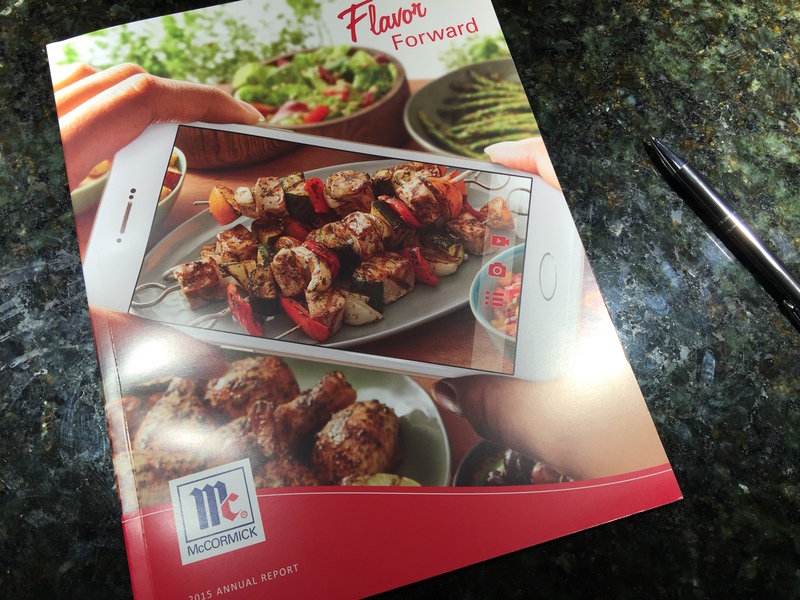 Wait – before I move on and while we are on the topic – you know how I love the scented McCormick & Company annual report that shows up each year? The one I talked about last year, too? The 2015 installment showed up recently and when I opened the envelope, the fragrance of coriander flooded the car. If you want a case study of how international currency movements can significantly depress reported earnings, causing return on equity and return on assets to look substantially lower than they really are and making the price-to-earnings ratio, PEG ratio, and dividend-adjusted PEG ratio appear substantially higher than they really are, now would be a good time. It really is one of the greatest businesses that most investors never pay attention to when discussing stocks. You’ll almost never hear someone at a cocktail party talking about their continuous acquisition of ownership in the world’s largest spice empire, instead going on and on about some new technology startup or financial enterprise. Yet, there it is, year after year, decade after decade, generation after generation showering its equity holders with more money due to a virtually unshakable hold global spices. The core owner earnings are so good, no matter how poorly the stock does in the short-term, they exert their influence over time. Over the past 1, 5, 10, and 20 year period, respectively, total return has been 18%, 17%, 13%, and 13%, the latter period including one of the worst equity market environments in American history from both the dot-com bust, the September 11th recession, and the 2007-2009 Great Recession. That’s what happens when you supply 9 of the top 10 food and beverage companies in the world; when you earn such high returns on capital you can give back 46% of cash flow from operations to owners in the form of dividends and share repurchases net of option exercises while spending another 34% on acquisitions (only 20% needs to be used for capital expenditures, and not all of those are maintenance capital expenditures – the financiers among you just had your heat beat accelerate, I imagine). The firm has paid a dividend for 90 consecutive years and increased that dividend every single year for the past 30 years. It is 4x the size of its nearest competitor. In some countries, the market share exceeds 50%. The employees own a huge part of the business. Even the financial reporting is beautifully presented (see page 31 of the 10-K form for the Consumer Segment desegregation of the sources of growth year-over-year; that is the kind of presentation a shareholder-friendly management puts together). Personally, I think it’s overvalued at the moment but it’s one of those companies that, even if we go into a 1973-1974 and it loses 75% of its market value over 2-3 years, it probably isn’t going to make a bit of difference over the next 25 years. If anything, due to the return accelerator mathematical phenomenon we discussed from the research at Wharton when we went over the oil majors, the volatility would make investors who reinvested their dividends wealthier than they otherwise would have been (consider it compensation for watching your money seemingly disappear on you for years at a time). The biggest danger would be the risk of a “take-under”, for a lack of a better term, which I discussed awhile ago. Basically, if equities get cheap and a buyout offer comes along higher than the then-lower market price but substantially below long-term intrinsic value, you might be forced to have your losses permanently cemented in place. That’s one of the reasons diversification is so important. Nevertheless, whenever it’s within striking distance of intrinsic value, McCormick is one of those things I like to buy for myself and the family; voting shares, non-voting shares, doesn’t matter. I have it shoved everywhere; our accounts, my brother’s retirement accounts, my parents’ accounts, my in-laws’ accounts. You can hardly flavor your food in most of the world without indirectly sending us dividends. I love this business. The shares Aaron and I buy are often intended for our future grandchildren. That … was an unexpectedly long detour. I get carried away when talking about those handful of 100 or firms out of the 30,000+ publicly traded ones that are really extraordinary. Back to the point of the post. As part of one of our projects this year, “Addition Through Subtraction” Aaron and I have been going through every facet of our lives, no matter how small, and identifying the things that can be removed to make us happier. One of the things we have been removing is complexity. This goes far beyond the minimalism and decluttering project. We started with the refrigerator and freezer, building upon our earlier pantry system. 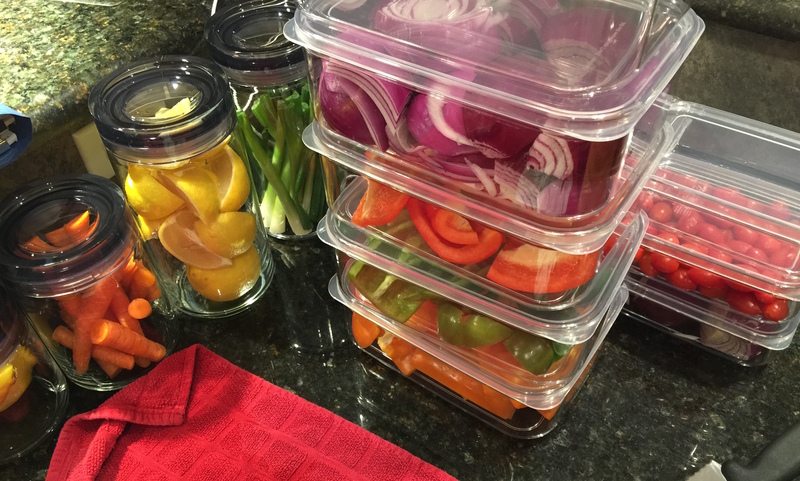 One night, we researched and picked up the best fresh food storage containers we could find consistent with our aesthetic, threw out almost everything, and began a policy of keeping, with very few exceptions, only fresh, raw ingredients so all meals are made from scratch without preservatives. This means fresh onions, peppers, tomatoes, carrots, and more are stored on a schedule so little to nothing goes bad. 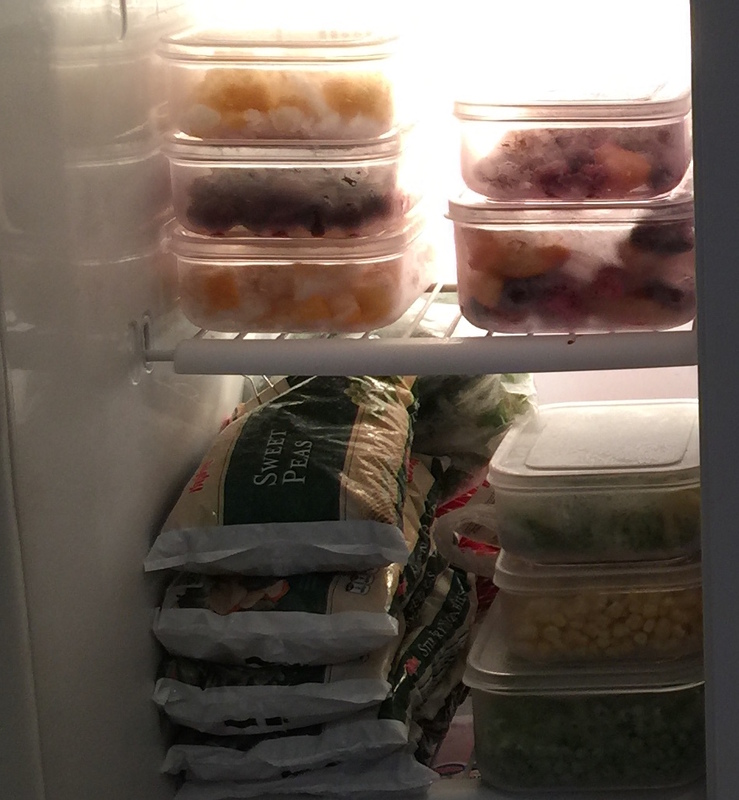 It takes a bit more work when grocery shopping because we have to spend an hour or so in the kitchen putting everything up but the time saving in the long-run is shocking. I could never go back to how we did it before this. Want a stir-fry? No problem, everything is ready. Feel like making a soup? Go ahead, it’s almost all right there waiting for you. The net efficiency gain is staggering. The freezer we’re still working on because we need to special order in more of the sizes we want as they aren’t available in the Kansas City market. We use it as a way to store out-of-season fruit and vegetables. Here’s a picture of how we have it setup thus far. The top contains mangos, peaches, black cherries, a blackberry/raspberry mix, and a grape/cantaloupe/pineapple mix. The next shelf down contains broccoli, corn, sweet peas, and various vegetable medleys. We’ve also removed almost all of our spare coffee mugs, glasses, and dish ware, reducing down to a handful of core sets that perfectly match. Part of this “addition through subtraction” project builds upon our earlier projects, taking them further than we were willing to go; fully committed, no looking back. We have filled four or five carloads of paperwork, representing at least five or more stuffed file cabinets, with paperwork that is now digitized and in the cloud. We have sold or donated furniture, lamps, office equipment; you name it. I’ve thrown away decades worth of old stock reports. It’s all on the iPad Pro now. I’m hoping to be completely done by the end of second quarter. Our personal finances are now radically simplified after a post I wrote back in November of 2014, when we decided to get rid of debt and consolidate our holdings. Other than a small 3.75% fixed-rate mortgage, which will get paid off when we move in a couple of years, anyway, so it doesn’t bother me as I have much better uses for the money, we now have no debt. No student loan debt. No car debt. No credit card debt. No consumer debt. No business debt other than ordinary working capital balances (e.g., payables that arise in the ordinary course of the cash conversion cycle). Nothing. Even the buyout of one of the private businesses, when we acquired 100% of the stock from the other shareholders, is now paid in full. Everything down to staples in the stapler are entirely equity. We’ve donated or thrown out 75% of our wardrobes. We need to rebuild them but we’ll probably put that off until later in the year, wearing jeans and t-shirts in the meantime. We’ve hired specialists to come into the house and do maintenance checkups. That will be handy when we eventually sell the house and move. We decided we didn’t like our shampoo and conditioner so we went on a testing binge, finally settling on the one we like best. Yeah, it’s $33 a bottle but who cares? We tried everything, too. Discount store brands. Salon brands. Department store brands. We’re working on our sleep cycles. For example, we will have no electronic devices such as iPads in the bedroom to distract us or throw off our circadian rhythm. Even things that other people wouldn’t care about or necessarily notice have gone on the list. Both Aaron and I have teeth that are better than 95% of the population, yet there were some small, minor misalignment that we didn’t like; things most people wouldn’t notice or care about. We’re better than that. Life is a gift and if something is within our control to change that we want changed, we owe it to ourselves to do it. Part of it is also an awareness of the power of signaling theory with the upcoming launch of the asset management group. So, we decided to get it fixed. Since it’s cosmetic, it will take only 6 to 12 months but right now, as I type this, I have braces on, a full mouth of metal like a 15 year old (I told the orthodontist that I wanted the best, fastest, most effective treatment possible regardless of aesthetics so I could get it over and done with; old-school won in the end.). I spent three hours in a chair on Monday having an industrial diamond saw hacking away at part of my teeth as it reshaped my smile and having the brackets and wires cemented after it was completed. Aaron’s are set to be put on within the next couple of weeks. That has led to some interesting culinary experiments. Since I’ve basically had to be on a liquid diet, we’ve been adapting our menu around it. I’ve been playing around with various types of smoothies. 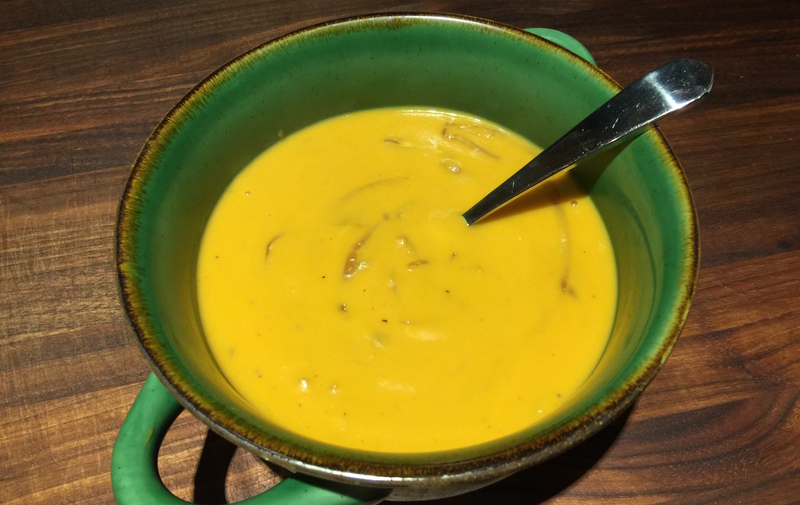 Yesterday, Aaron made me a sweet potato and caramelized onion soup from the New England Soup Factory cookbook. 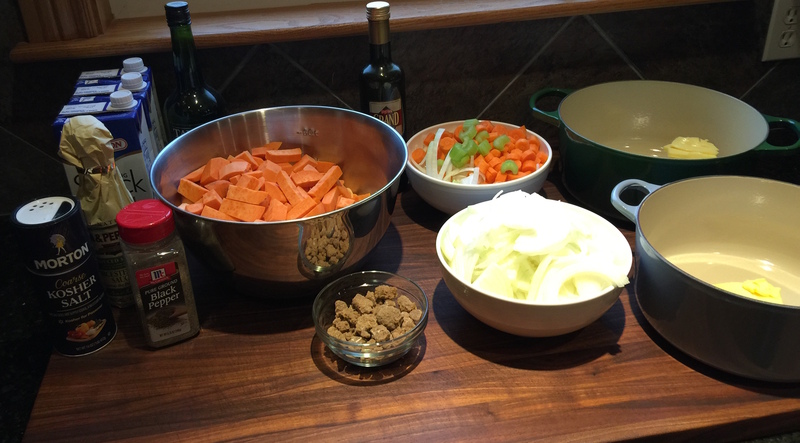 You sauté onions, carrots, celery, and brown sugar in butter, add sweet potatoes, boil it in chicken stock, add light cream, Worcester sauce, sherry, and caramelized onions which had been cooked in a bit of brown sugar on the side, to end up with this rich, winter soup. It’s delicious.